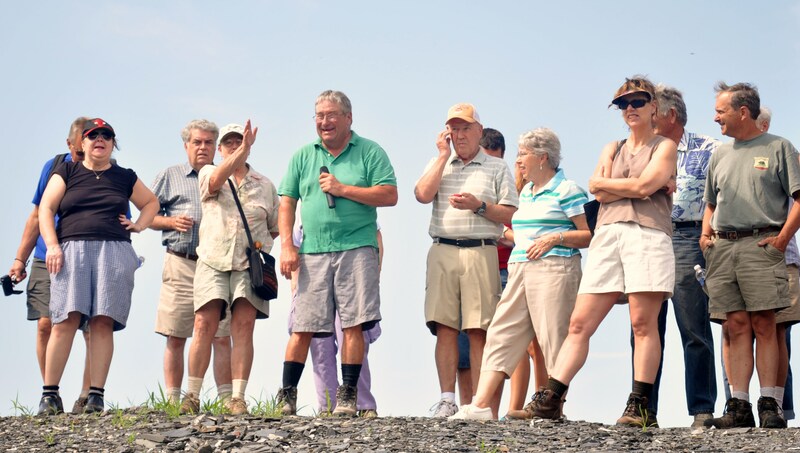 Last Saturday, the Slate Valley Museum offered our first quarry tour in four years. We were not sure if it was actually going to happen. We had to cancel it once because of severe mud at the quarry due to all the rain we had during the month of June. It would have been very hard for a large group of people to park and walk around in the quarry. Thankfully, the recent hot and sunny weather dried up the road enough so that it was safe for visitors. What a beautiful day! After severe heat and rain, we were lucky to have a sunny day with a slight breeze. This image was taken on the other side of the quarry road. The group arrived at the museum first for a curator’s talk about our newest exhibit, “Preserving a Heritage, Building a Community: Carpatho-Rusyns in the Slate Valley”. Kathryn Weller and Amy Mincher discussed how Eastern European immigrants carved out a life in the Granville area around the turn of the century. Visitors got to see the video of Mike “Pinkie” Labas splitting slate in the dooryard of the trimming shanty at the Labas quarry that we were about to visit. To see a bit of this video, check it out on our Facebook page: https://www.facebook.com/photo.php?v=586332931388335. All of the black circles are quarries. The state line is in the center. 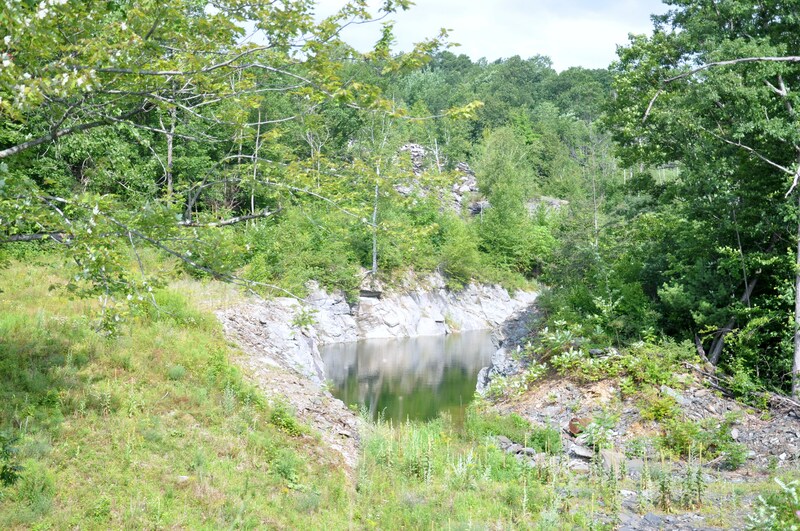 As he led the group through the quarry, he talked about his family history and also how and when slate had been taken out of different sections of the quarry. He mentioned that his father had purchased the quarry for less than a thousand dollars, but they have spent millions of dollars on equipment and labor to actually quarry it. Mike answers questions while at the top of the quarry. Mike and his son also demonstrated how to cleave a large block of slate, split a book of slate, and trim it using a zip trimmer and a barrel trimmer. The group asked MANY questions which were all answered by Mike. Please let us know if you are interested in going on a quarry tour. If there is enough interest, we will plan one for the fall! Here are some other images of the tour taken by Andrea Macura, photographer extraordinaire. This entry was posted in Uncategorized and tagged Carpatho-Rusyns, Immigrants, Quarries, slate, Slate Valley Museum, Slovakians. Bookmark the permalink.